A brilliant mind at work. 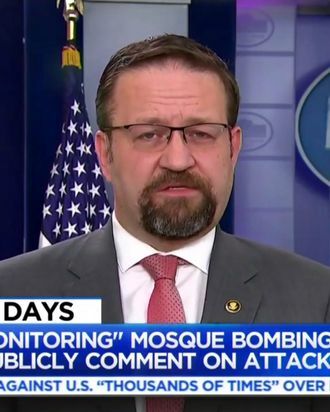 In a Tuesday appearance on MSNBC, Nazi-ish quasi–White House adviser Sebastian Gorka put forth a bizarre justification for the radio silence: The attack, you see, may have been perpetrated by the left. The Trump administration’s muted response follows a clear pattern of playing down attacks by white perpetrators on minorities. When a Canadian white nationalist — and Trump admirer — killed six people in January, the president said nothing publicly. And when a man yelled “Get out of my country” while shooting and killing an Indian engineer in Kansas, Trump was deafeningly silent for a week before he finally acknowledged the crime. Then there are the thousands of other minor incidents and threats targeting Muslim people and institutions that the president has failed to acknowledge. In a way, the Trump administration’s refusal to acknowledge attacks on Muslims and other minorities makes sense, since it is Trump himself who is the proximate cause of the uptick in such incidents. The steep rise in anti-immigrant and anti-Semitic incidents since the beginning of his campaign is a testament to the president’s ability to stir up anger and hatred. But even he may be too squeamish to acknowledge that he has contributed to making America into a more intolerant place.